Magnesium reduces vascular smooth muscle cell (VSMC) calcification in vitro but the mechanism has not been revealed so far. This work used only slightly increased magnesium levels and aimed at determining: a) whether inhibition of magnesium transport into the cell influences VSMC calcification, b) whether Wnt/β-catenin signaling, a key mediator of osteogenic differentiation, is modified by magnesium and c) whether magnesium can influence already established vascular calcification. Human VSMC incubated with high phosphate (3.3 mM) and moderately elevated magnesium (1.4 mM) significantly reduced VSMC calcification and expression of the osteogenic transcription factors Cbfa-1 and osterix, and up-regulated expression of the natural calcification inhibitors matrix Gla protein (MGP) and osteoprotegerin (OPG). The protective effects of magnesium on calcification and expression of osteogenic markers were no longer observed in VSMC cultured with an inhibitor of cellular magnesium transport (2-aminoethoxy-diphenylborate [2-APB]). 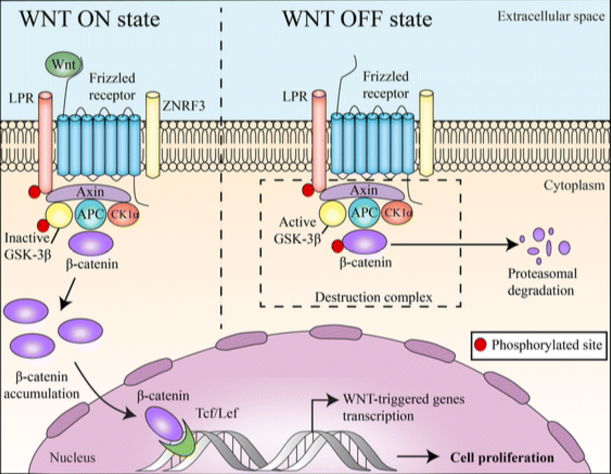 High phosphate induced activation of Wnt/β-catenin pathway as demonstrated by the translocation of β-catenin into the nucleus, increased expression of the frizzled-3 gene, and downregulation of Dkk-1 gene, a specific antagonist of the Wnt/β-catenin signaling pathway. The addition of magnesium however inhibited phosphate-induced activation of Wnt/β-catenin signaling pathway. Furthermore, TRPM7 silencing using siRNA resulted in activation of Wnt/β-catenin signaling pathway. Additional experiments were performed to test the ability of magnesium to halt the progression of already established VSMC calcification in vitro. The delayed addition of magnesium decreased calcium content, down-regulated Cbfa-1 and osterix and up-regulated MGP and OPG, when compared with a control group. This effect was not observed when 2-APB was added. In conclusion, magnesium transport through the cell membrane is important to inhibit VSMC calcification in vitro. Inhibition of Wnt/β-catenin by magnesium is one potential intracellular mechanism by which this anti-calcifying effect is achieved. [Role of Wnt/β-catenin signaling pathway in promoting tumorigenesis of hepatocellular carcinoma]. Xie L1, Jiang H, Wu F.
Beilun District TCM hospital, Ningbo 315800, China.